If you have been reading Hentown Mama for a while then you know that an overwhelming theme in our lives since Allume is saying "yes". We have been saying "yes" to God's promptings, to the hard stuff, and to creating an awareness for some amazing causes that we are finding out about. I recently read a book about how one mom's yes is changing lives worldwide. Readers of Hentown Mama already know about the end result. 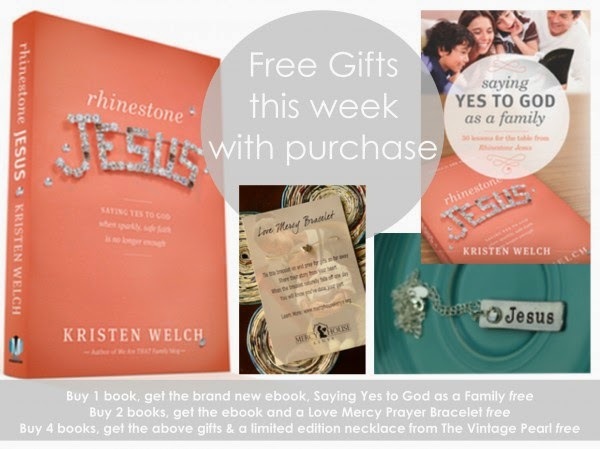 Rhinestone Jesus is the story of how Kristen Welch went on a journey and the founded the amazing Mercy House in Kenya. Rhinestone Jesus: Saying Yes to God When Sparkly, Safe Faith Is No Longer Enough starts when Kristen is just a kid with her heart on her sleeve and a rhinestone Jesus pin on her shirt. It continues with her journey through college, marriage, motherhood, disappointments, and joys. Kristen stopped dreaming during this journey until a Compassion Bloggers trip changed it all. In a life changing trip, Kristen met Maureen and later, after returning to the states, the idea for Mercy House was born. I love Mercy House Kenya and the work that is going on there. I love how one mom's "yes" began such an amazing journey. It let's you know that no matter who you are- YOUR YES MATTERS!!!!! This book is not just the story of Kristen and her family though. This story is the story of God- sized dreams coming true. It is inspiring and heart warming. Reading this book renewed my desire to continue to dream. I was honestly starting to lose that. But this book, this book renewed my complete desire to say "yes". And as a family, we are doing that. We are saying "yes" to dreams we thought would never come true. And there is a excitement in the journey like we have never had. I am letting you know about this book today because there is some amazing gifts if you pre-order the book by April 30th. The book releases officially on May 1. But look at the awesome gifts that you can get if you order it today. Click HERE to find out more.